Battleship. 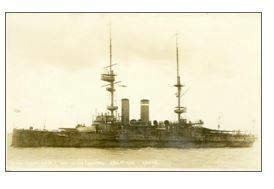 Sank on 01.01.1915, twenty five miles off Portland, by two torpedoes from German Submarine. U-24. 547 men were lost, including two men from Thame, and 233 survived.